Django Unchained (2012), wrote the screenplay and directed. That is an extremely impressive list. Whatever your impressions of his output, you cannot argue against the fact that Tarantino has had his finger on the pulse of the cinema-going public’s taste for a very long time now. The stories and screenplays Tarantino has penned for feature-length films are more-or-less all crime-related thrillers. Inglourious Basterds is a war movie and Django Unchained is a western; both genres – I would argue – relate strongly to crime. While some of his scripts have a little more adventure, some have more action, a couple include elements of horror, and others are more dramatic, they are all essentially crime thrillers. And almost all of Tarantino’s writing is black comedy. Reservoir Dogs is his only script which was played mostly straight; there’s some comedy thrown in there but it’s definitely not a black comedy. But all his other films have characters and situations with a large element of ludicrousness thrown in. Django Unchained is probably Tarantino’s funniest penning to date. It is not classed as a comedy on IMDb but it must be the funniest film I have seen in a very long time. And yet, the film still manages to successfully bring a touchy subject back to the fore, reminding us of the brutalities and inequalities of the times of slavery; not only the physical subjugation and psychological dehumanization of the slaves but also the inhumanity of their all-powerful masters. But is there a new lesson for us to learn from Tarantino’s reminder of how things used to be in not-so-long-ago America or is this film simply an exploitation of a very real and ugly past? I’m not so sure, to be honest. If there is a danger, it may be towards an increase in anti-white bigotry. But, surely, even worse than any such risk is the notion that we should censor artistic output which lays bare a historical truth? As is customary with him, the director again uses well-known actors in roles that redefine their skills as artists (Samuel L. Jackson) or place them back on the cinematic map (Don Johnson). The cast list is long and formidable, with the likes of Bruce Dern, ￼Robert Carradine and ￼Ted Neeley in minor roles. ￼Even ￼Franco Nero, the star of the original Italian western Django (1966), makes a brief appearance. I think that quote emphasizes an important point: Tarantino has been around long enough for people to know what to expect from him. Tarantino makes Tarantino-esque pictures. Those who love his work know who they are. And those who do not should know to stay away. Once again, this auteur has written and produced a visual feast, filled with original and colourful characters which have to fight their way through preposterous situations. Tarantino glues us to the screen by giving us interesting people we care about placed in circumstances whose conclusions are almost always unpredictable. And he does this in a style cooler than any other cat directing movies these days. As always, we recommend you don’t ruin any surprises by reading spoilers or watching trailers. I must watch Django Unchained. What’s wrong with me? Limited time, just like the rest of us! I really enjoyed this movie and the impressive sound track. Yes, I never mentioned the soundtrack in my review! What a brilliant eclectic mix of music genres. 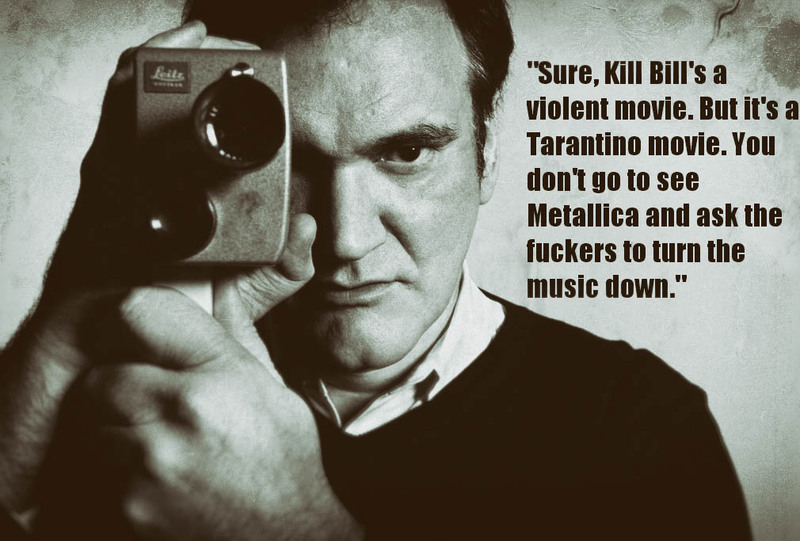 Tarantino really is good at that. He just tells a compelling story. Absolutely, Abbi. But he does it with such bravado too! I enjoyed it for what it was. “Tarantino has been around long enough for people to know what to expect from him.” An excellent point. Anyone should be embarrassed to ask Metallica to turn it down. Thank you for sharing your review. Now, I’ll probably watch it! Hi Kristi. I’ve been trying to decide which is my favourite of his. I think Jackie Brown or Pulp Fiction. I guess Pulp Fiction. Have you seen them all? I still haven’t seen Four Rooms. I loved Pulp Fiction’s characters and messed-up story but Reservoir Dogs still is my favourite by a long long shot. Loved the graphic and sound design in Django, had a good laugh with slave vengeance stravaganza. BUT my dear Shimky I can’t believe you talked about Django and you forgot to mention Christoph Waltz’s COLOSSAL work. Actually just to see this great actor was worth the Inglourious Basterds’ penitence. Hopefully you don’t go the “maybe Tarantino it’s not a director for you” way, you know, for me being entertained it’s not the same as being soul fed. Hi Max! Thank you for your awesome comments. I agree with most of what you’ve said about Tarantino. That vimeo you linked is so interesting; he really is the ultimate remixer, isn’t he! But as Pablo Picasso said, “Good artists borrow, great artists steal”. ¡Si Señor! I’m not sure really if Tarantino’s take on slavery is in any way damaging. I really don’t think a film like ‘Django Unchained’ is taken seriously, yet it still manages to show the absolute brutality of the era. So we are certainly being informed in one manner or another. Maybe it’s good that viewers who aren’t drawn towards films such as ’12 Years a Slave’ still get a glimpse of history. But, of course, if they are so ill-informed that they take the whole film as historically accurate, then we definitely do have a big problem! To be honest, I don’t think I am qualified to answer that question, but if you would interested in expanding upon your thoughts, I would be very interested in reading them. Christoph Waltz is amazing, isn’t he! I must watch some of his Austrian/German films. Have you seen any you could recommend? I take it from your comments that you didn’t like ‘Inglourious Basterds’? I hated it the first time I watched it. But I completely changed my mind upon a second viewing. It really is a very well made film, in my opinion. Again, it’s bastardizing history for the sake of a good backdrop to an entertaining movie. That remind me… ‘Inglourious Basterds’ and ‘Django Unchained’ are part of a planned history remix trilogy by Tarantino, aren’t they? I think I read that somewhere. Yep, i’m a Tarantino fan and i loved this film! Over the top, ironic, bellowing-ly crazy on occasion. I saw Django at a screening and it was like a party up in there. For me, the movie hit its peak when we hear Tupac as the guns start blazing near the end. Well almost near the end. The crowd erupted in applause and laughter and I may have shouted an gleeful expletive directly at the screen. That Tarantino threw gangsta rap in the middle of a slave’s revenge killing spree is just pure 21st century cinematic gold. No one does it better. I agree. How that rap worked in that scene is beyond me. But it does! Utter brilliance. I’m glad you agree, Andrés! That’s an interesting question! I wonder which directors have killed themselves in one of their own movies. I googled it but didn’t come up with anything. Anyone else have any other examples? 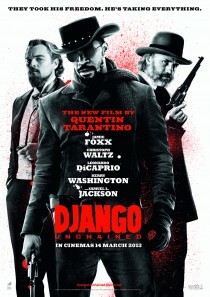 Tarantino is brilliant, Django Unchained is brilliant. Nice review Shimky! Django Unchained, much like Inlgoious Basterds, is lame and redundant. Tarantino should take a break, and look for some inpspiration before make another movie. I really did think Inglourious Basterds was awful the first time I watched it. But with a second viewing, my opinion totally changed. Thanks, Emma, bee keeper extraordinaire! Been wanting to see this movie and have yet to do it. Ooh, you must! It’s such good fun. Did you love it, Kerry? I thought it was hilarious! I have watched this a few times! Love it!